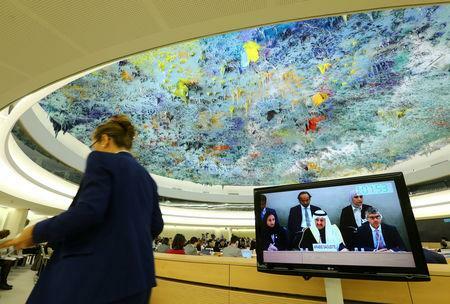 Bandar Al Aiban, the head of the Saudi government delegation at the first U.N. review of the kingdom's record in five years, heard calls from more than 40 nations, including the United States, for a thorough inquiry and a string of rights reforms. He told the hearing that King Salman had instructed the Saudi public prosecutor to "proceed with the investigation into this case according to the applicable laws" with a view to establishing the facts and "bringing all the perpetrators to justice". "As regards the passing of citizen Khashoggi, our country is committed to carrying out a fair investigation and all persons involved with that crime will be prosecuted in the justice system," Aiban said at the end of the half-day session. Aiban gave no details on the status or whereabouts of the 18 Saudi nationals detained in connection with the case and repeatedly declined to answer journalists' questions about them, saying: "The case is still under investigation, as you know...I think my statement was very clear." Khashoggi's sons on Monday demanded the return of the body of the Washington Post columnist and critic of the Saudi government, who disappeared at the consulate on Oct. 2. "We condemn this premeditated killing," U.S. charge d'affaires Mark Cassayre told the Geneva talks. "A thorough, conclusive and transparent investigation carried out in accordance with due process with results made public is essential," he said. Many Western delegations called on Riyadh to abolish the death penalty and the system of male guardianship over women, and to narrow the definition of "terrorism" in law so that peaceful critics are not prosecuted. France's ambassador Francois Rivasseau called on Saudi Arabia to "immediate halt imprisonment and arbitrary arrests" of journalists and activists, and to guarantee freedom of religion. Aiban, who is president of the official Human Rights Commission of Saudi Arabia, said the kingdom was constantly striving to promote and protect human rights "driven by the honorable principles and provisions of Islamic sharia and the traditional values of our society." Freedom of opinion and expression were guaranteed, but was limited by laws that protect the rights of others as well as the "prerequisites of national security and public order", he said. Egypt's ambassador Alaa Youssef praised Saudi Arabia's efforts to confront terrorism and radicalism, while Kuwait welcomed its creation of training centers for judges.